For our Indian Tents team, creating Luxury Wedding Tents for classic weddings is a mastered art. 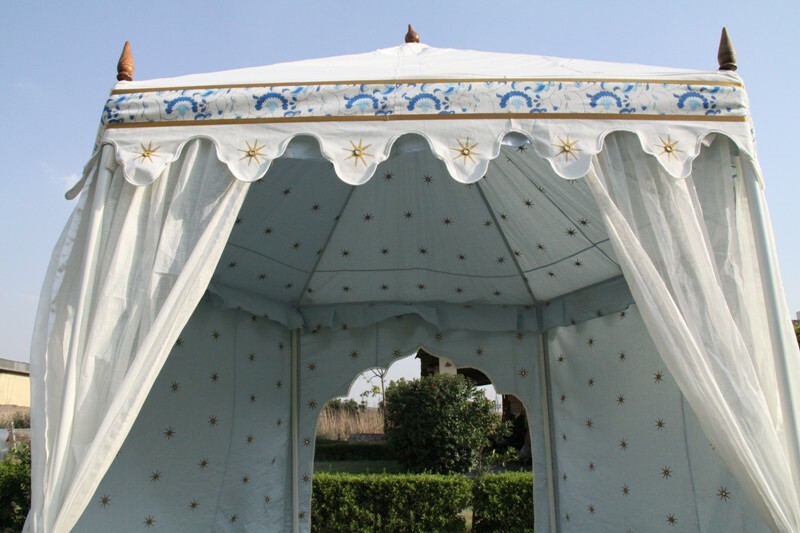 We create luxury tents in the western designs with traditional and Stunning themes from Indian art and architecture. In spite of this, there is plenty of room for individual taste and expression of our clients, for their theme wedding. 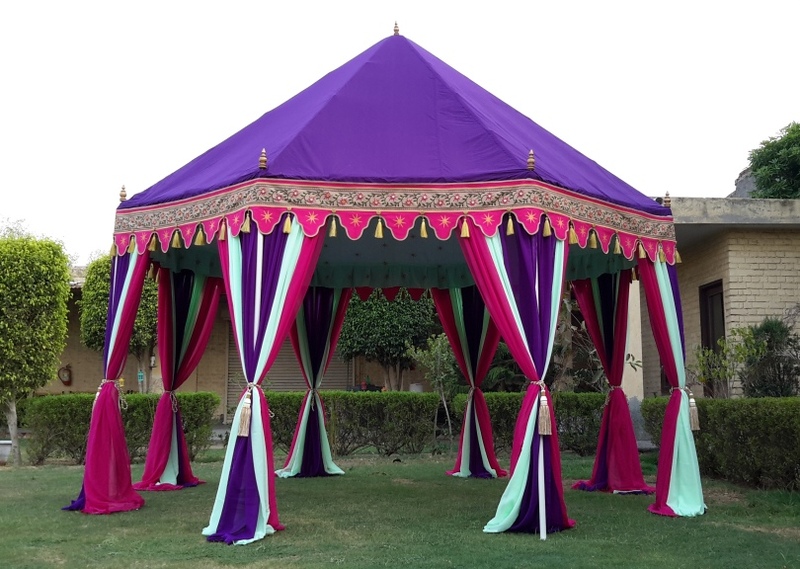 Luxury Wedding Tents make your wedding come alive with vibrant colors and hues from our very wide collection of Voile drapes and printed inner linings. For each tent we create, special attention is given to detail and design. We create Classic elegance with block print patterns from forts and palaces in Jaipur. We understated, the classic weddings tastes of our esteemed clients. So, you can customize a lot to create the right environment and mood for your wedding ceremony. Wedding is a once in a lifetime experience, so plan it in the most classy way with our special range of Wedding Party Tents. 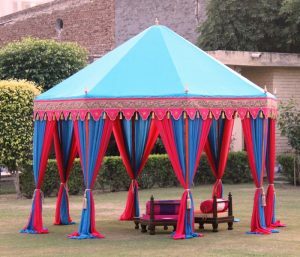 Our extensive range of Wedding tents has big tents like the Hava Mahal and small tents like the Cupolas and Pergolas to breathe life and elegance into your Big day function. Keep your wedding Classy and simple with White Canvas Tents or add striking Hues and colors like our signature Red Canvas tent to make it stand out. There are lots of themes and print options to make your wedding a Splendid One ! Best Garden Tents for Sale ! 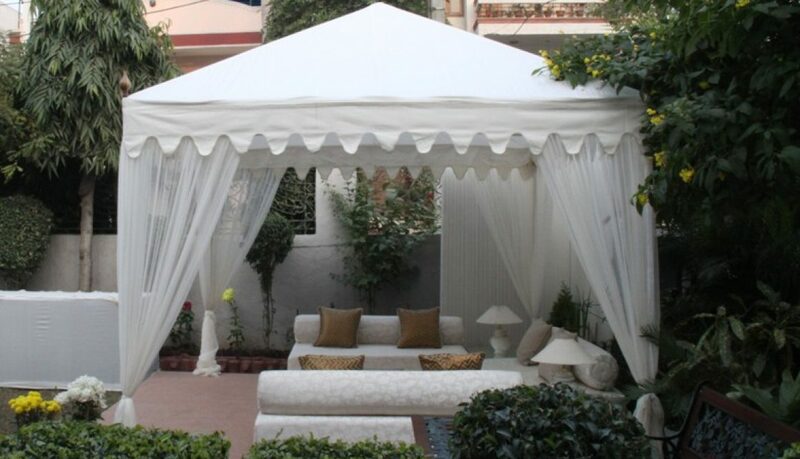 Best Garden Tents are on Sale from Sangeeta International India. 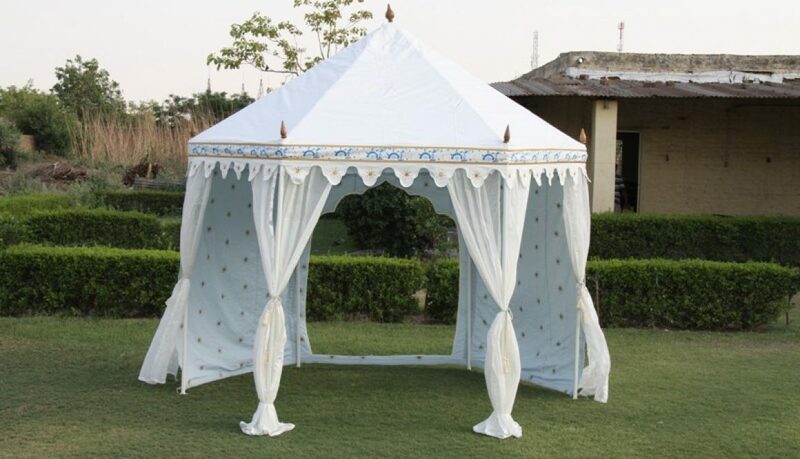 You can buy this beautiful garden tent directly from us. 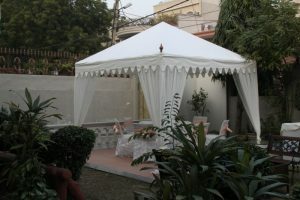 This is a 6 -sided Canvas tent, with some side walls for privacy and rest sheer curtains. We offer a beautiful printed Valance with flower motifs and Roman Valance, printed with Stars & Mirrors stitched onto each star. 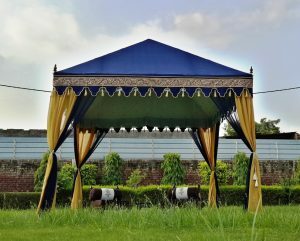 Elegant interiors, give a royal touch to this Garden Gazebo on Frame. The Frame is easy to erect and dismantle, for easy storage. 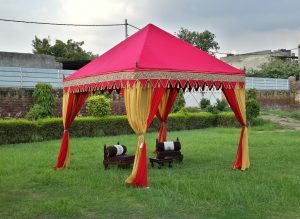 Indian Party tents & gazebos are best selling world wide to host small personal events. 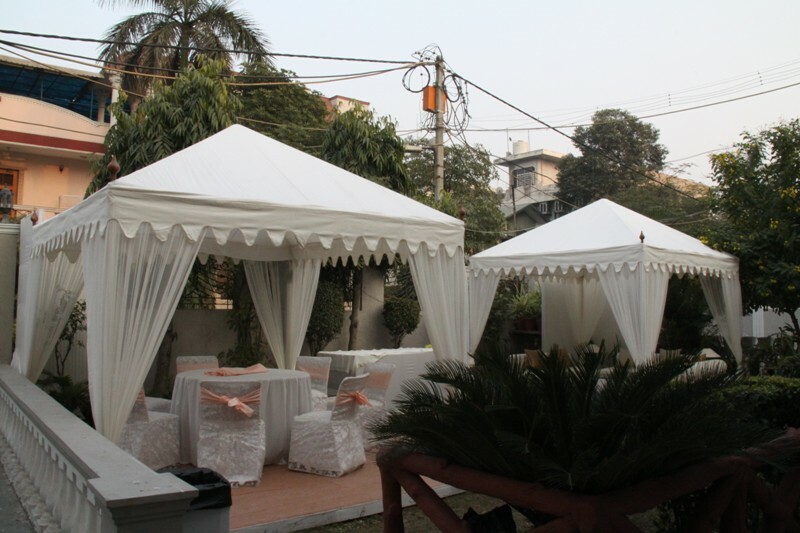 We make small canvas canopies for your personal party, in private lawns & gardens. 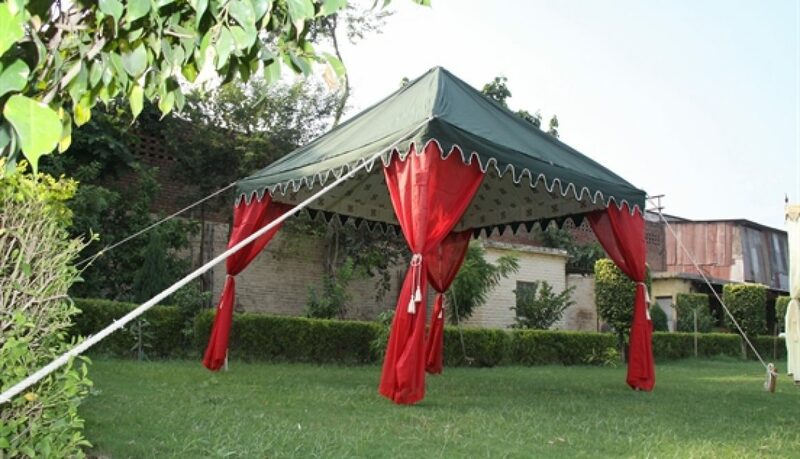 This folding canopy is very easy to erect & dismantle for garden party. 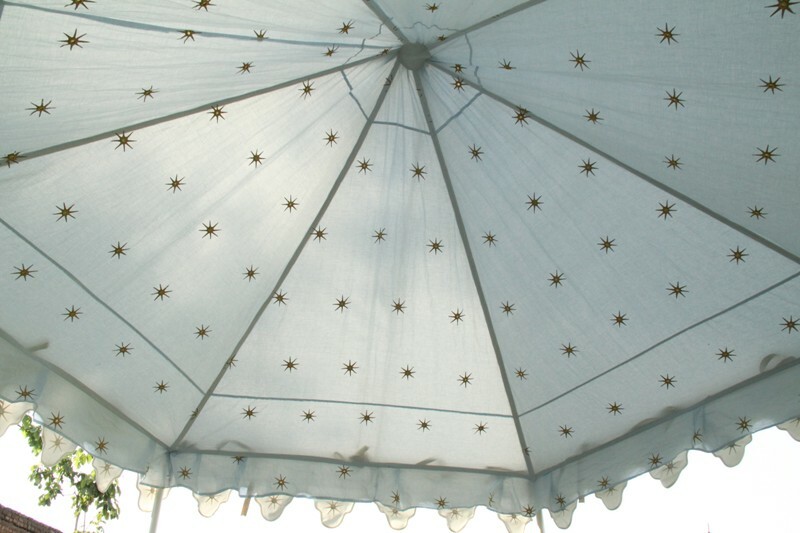 You only need 2 people ti erect this canopy. It comes in various colors, as you can see in the pictures. 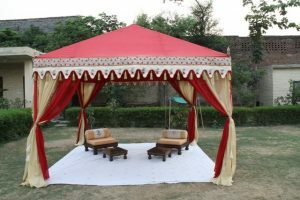 We have the Best and most experienced tailors and craftsmen of tents, some of them are working with us from the last 25 to 30 years. We do not compromise in any way on quality or craftsman ship and trial pitch almost every tent in our factory to check for any flaws before packing the tent up for dispatch. You can completely rely on our creative team to suggest the best designs for your customized tents and marquees. To know more About Us, click here. Add some beautiful Low Wooden Seats to your Tent for a perfect setting. 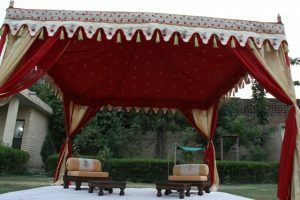 We offer, mandap stools, low wooden chairs, Velvet top stools and also Wooden day cots. We also make low floor sitting with mattress and Bolsters for the Royal seating.